Alice Joséphine Pons (April 12, 1898 – February 13, 1976), known professionally as Lily Pons, was a French-American operatic soprano and actress who had an active career from the late 1920s through the early 1970s. As an opera singer she specialized in the coloratura soprano repertoire and was particularly associated with the title roles in Lakmé and Lucia di Lammermoor. In addition to appearing as a guest artist with many opera houses internationally, Pons enjoyed a long association with the Metropolitan Opera in New York City, where she performed nearly 300 times between 1931 and 1960. Pons was also savvy at making herself into a marketable cultural icon. Her opinions on fashion and home decorating were frequently reported in women's magazines, and she appeared as the face for Lockheed airplanes, Knox gelatin and Libby's tomato juice advertisements. A town in Maryland named itself after her, and thereafter the singer contrived to have all her Christmas cards posted from Lilypons, Maryland. Opera News wrote in 2011, "Pons promoted herself with a kind of marketing savvy that no singer ever had shown before, and very few have since; only Luciano Pavarotti was quite so successful at exploiting the mass media." Pons was born in Draguignan near Cannes, to a French father, Léonard Louis Auguste Antoine Pons, and an Italian-born mother, Maria (née Naso), later known as Marie Pétronille Pons. She first studied piano at the Paris Conservatory, winning the First Prize at the age of 15. At the onset of World War I in 1914, she moved with her mother and younger sister Juliette (born December 22, 1902 – died 1995) to Cannes where she played piano and sang for soldiers at receptions given in support of the French troops and at the famous Hotel Carlton that had been transformed into a hospital, and where her mother worked as a volunteer nurse orderly. In 1925, encouraged by soprano Dyna Beumer [nl] and Mesritz, who agreed to fund her singing career, she started taking singing lessons in Paris with Alberto de Gorostiaga [es]. She later studied singing with Alice Zeppilli in New York. On October 15, 1930, Pons married her first husband, August Mesritz, a successful publisher, and spent the next several years as a housewife. The marriage would end in divorce on December 7, 1933. 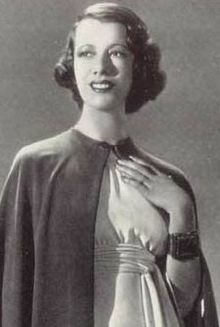 Pons successfully made her operatic debut in the title role of Léo Delibes' Lakmé at Mulhouse in 1928 under Reynaldo Hahn's baton and went on to sing several coloratura roles in French provincial opera houses. She was discovered by the dramatic tenor/impresario Giovanni Zenatello, who took her to New York where she auditioned for Giulio Gatti-Casazza, the general manager of the Metropolitan Opera. The Met needed a star coloratura after the retirement of Amelita Galli-Curci in January, 1930. Gatti-Casazza engaged Pons immediately and she also signed a recording contract with RCA Victor. On January 3, 1931, Pons, unknown in the U.S., made an unheralded Met debut as Lucia in Donizetti's Lucia di Lammermoor and on that occasion the spelling of her first name was changed to "Lily". Her performance received tremendous acclaim. She became a star and inherited most of Galli-Curci's important coloratura roles. Her career after this point was primarily in the United States. She became a naturalized citizen of the United States in 1940. From 1938 to 1958, she was married to conductor Andre Kostelanetz. In 1955 they built a home in Palm Springs, California. Pons was a principal soprano at the Met for thirty years, appearing 300 times in ten roles from 1931 until 1960. Her most frequent performances were as Lucia (93 performances), Lakmé (50 performances), Gilda in Verdi's Rigoletto (49 performances), and Rosina in Rossini's The Barber of Seville (33 performances). She drew a record crowd of over 300,000 to Chicago's Grant Park Music Festival in 1939 for a free concert. In 1944, during World War II, Pons canceled her fall and winter season in New York and instead toured with the USO, entertaining troops with her singing. Her husband Andre Kostelanetz directed a band composed of American soldiers as accompaniment to her voice. The pair performed at military bases in North Africa, Italy, the Middle East, the Persian Gulf, India and Burma in 1944. In places, the heat of the sun at the outdoor performances was so overbearing that Pons, always wearing a strapless evening gown, held wet towels to her head between numbers. In 1945, the tour continued through China, Belgium, France and Germany—a performance near the front lines. Returning home, she toured the U.S., breaking attendance records in cities such as Milwaukee at which 30,000 attended her performance on July 20, 1945. That same month she also played Mexico City, directed by Gaetano Merola. Other roles in her repertoire included Olympia in Jacques Offenbach's The Tales of Hoffmann, Philine in Ambroise Thomas's Mignon, Amina in Vincenzo Bellini's La sonnambula, Marie in Donizetti's The Daughter of the Regiment, the title role in Léo Delibes's Lakmé, the Queen in Nikolai Rimsky-Korsakov's Golden Cockerel, and the title role in Donizetti's Linda di Chamounix, (a role she sang in the opera's Met premiere on March 1, 1934). The last major new role Pons performed (she learned the role during her first season at The Met) was Violetta in La traviata, which she sang at the San Francisco Opera. Another role Pons learned, but decided not to sing was Melisande in Debussy's opera Pelléas et Melisande; the reason, as she confided in a later interview, was twofold: first, because she felt soprano Bidu Sayão owned the role; and, secondly, because the tessitura lay mainly in the middle register of the soprano voice rather than in the higher register. In her last performance at the Met, on December 14, 1960, she sang "Caro nome" from Rigoletto as part of a gala performance. She also made guest appearances at the Opéra Garnier in Paris, Royal Opera House in London, La Monnaie in Brussels, Teatro Colón in Buenos Aires, the Chicago Opera. Her final opera appearance was as Lucia to the Edgardo of twenty-one-year-old Plácido Domingo in 1962 at the Fort Worth Opera. She continued to sing concerts until 1973. On February 11, 1960, Pons appeared on NBC's The Ford Show, Starring Tennessee Ernie Ford. She starred in three RKO films: I Dream Too Much (1935) with Henry Fonda, That Girl from Paris (1936) and Hitting a New High (1937). She also performed an aria in the 1947 film Carnegie Hall. She died of pancreatic cancer in Dallas, Texas, at the age of 77. Her remains were brought back to her birthplace to be interred in the Cimetière du Grand Jas in Cannes. A village in Frederick County, Maryland, 10 miles south of Frederick, Maryland, is called Lilypons in her honor. George Gershwin was in the process of writing a piece of music dedicated to her when he died in 1937. The incomplete sketch was found among Gershwin's papers after his death and was eventually revived and completed by Michael Tilson Thomas; it was given the simple title, For Lily Pons. Pons donated Ita, her pet ocelot, to the New York Zoological Gardens when it became too dangerous to remain in her apartment in The Ansonia on Manhattan's Upper West Side. Pons had received the pet, which she believed was a baby jaguar, from a friend in Brazil. The pet and Pons were very attached to each other but it snarled at visitors and was deemed a hazard. The 1937 Merrie Melodies cartoon The Woods Are Full of Cuckoos caricatures Pons as "Lily Swans". In Stephen Frears's 2016 film Florence Foster Jenkins, Pons is played by Aida Garifullina. Pons left a large legacy of recordings, mostly on the RCA Victor and Columbia labels, many of which are available on LP and CD. ^ a b c Fred Cohn (October 2011). "Tiger Lily". Opera News. 76 (4). ^ a b Drake & Beall Ludecke 1999, p. 24. ^ Edwin Schallert (October 28, 1951). "Broadway Songstress, Captured by Films, Looks to Rosy Future". Los Angeles Times. ^ Meeks, Eric G. (2012). The Best Guide Ever to Palm Springs Celebrity Homes. Horatio Limburger Oglethorpe. p. 282. ISBN 978-1479328598. ^ Macaluso, Tony; Bachrach, Julia S.; Samors, Neal (2009). Sounds of Chicago's Lakefront: A Celebration Of The Grant Park Music Festival. Chicago's Book Press. p. 62. ISBN 978-0-9797892-6-7. ^ "Lily Pons Here". The Last Roundup. Delhi: Carl Warren Weidenburner. April 11, 1946. Archived from the original on June 30, 2012. Retrieved October 19, 2010. ^ Drake & Beall Ludecke 1999, p. 186. ^ Drake & Beall Ludecke 1999, p. 151. ^ Drake & Beall Ludecke 1999, p. 82. ^ "The Ford Show, Starring Tennessee Ernie Ford". www.ernieford.com. Archived from the original on December 21, 2010. Retrieved November 25, 2010. ^ "Lilypons, Maryland (MD)". AllRefer.com. Archived from the original on 2007-09-29. Retrieved 2009-12-08. ^ "Gershwin: Rhapsody In Blue, Preludes for Piano, Short Story, Violin Piece, Second Rhapsody, For Lily Pons, Sleepless Night, Promenade by Los Angeles Philharmonic & Michael Tilson Thomas" – via itunes.apple.com. ^ "For Lily Pons, for piano (Gershwin… | Recording Details and Tracks". AllMusic. ^ "George Gershwin, Michael Tilson Thomas, Los Angeles Philharmonic Orchestra - Gershwin: Rhapsody in Blue / Second Rhapsody For Orchestra with Piano / Klavier / Preludes Unpublished Piano Works - Amazon.com Music". www.amazon.com. ^ "Melody No. 79 "For Lily Pons"(Arr. M. Tilson Thomas for Piano) by Michael Tilson Thomas;Los Angeles Philharmonic on Amazon Music - Amazon.com". www.amazon.com. ^ Ericson, Raymond (August 18, 1985). "Gershwin Stars in a Display of American Musical Variety" – via NYTimes.com. ^ "For Lily Pons (Gershwin Melody #79)" performed by the Los Angeles Philharmonic & Michael Tilson Thomas on Gershwin: Rhapsody in Blue, Preludes for Piano, Short Story, Violin Piece, Second Rhapsody, For Lily Pons, Sleepless Night, Promenade, by Sony Classical/Legacy. ^ "Recommended Recordings of Music by George Gershwin (Music Feature)". music.minnesota.publicradio.org. ^ Twomey, Bill (February 20, 2015). "Met Opera's Lily Pons leaves pet at Bronx Zoo". Bronx Times-Reporter. p. 48. Drake, James A.; Beall Ludecke, Kristin (1999). Lily Pons: A Centennial Portrait. Amadeus Press. ISBN 1-57467-047-6. This page is based on the Wikipedia article Lily Pons; it is used under the Creative Commons Attribution-ShareAlike 3.0 Unported License (CC-BY-SA). You may redistribute it, verbatim or modified, providing that you comply with the terms of the CC-BY-SA.